Performers include: Ted Allen, Kyan Douglas, Thom Filicia, Carson Kressley, and Jai Rodriguez. Reality makeover show featuring five openly gay men (nicknamed the “Fab Five”) who team up to help transform a person’s life. Each member of the team guides the candidate in a particular area of expertise and usually in preparation for a special event such as a marriage proposal, a family reunion, or a special party. The experts are “food and wine connoisseur” Ted Allen, “grooming guru” Kyan Douglas, “design doctor” Thom Filicia, “fashion savant” Carson Kressley, and “culture vulture” Jai Rodriguez. An aging, ex-heavy-metal rocker named Willy lives in Queens with his girlfriend and their toddler son. Willy is the father of four and is preparing for his teenage son, Nathan, to move in with them. Willy currently works at the Queens Theater at Flushing Meadows Park and is part of a 1940’s style band. Nathan is a drummer. It’s hoped that their mutual love of music will bring them together and help make the move easier for Nathan who will be missing his mother. Unfortunately, Willy lives in a small three-bedroom apartment, and Nathan’s room is empty and unwelcoming. The Fab Five come to the rescue to create a warm home environment that will help bring Willy’s family together. First aired: October 30, 2007. • Episode 91, the last episode actually filmed, reunites the Fab Five with 25 of the show’s most popular makeover recipients> They compete in a “Straight Guy Pageant” which is hosted by soap opera star Susan Lucci. The 25 men compete in events in all Fab Five categories and the winner is crowned “The Ultimate Straight Guy.” This episode aired on October 2, 2007. 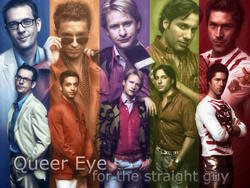 • The series title was shortened to Queer Eye at the start of season three when makeover recipients began to include women and gay men. • International versions of the series have aired in other countries but haven’t enjoyed the same popularity as the U.S. version. Most only lasted one or two seasons. • A Los Angeles-based spin-off series, Queer Eye for the Straight Girl, debuted on Bravo in 2005 but was cancelled after one season.